Notable boats — sail and power —continue to turn heads in Southern California harbors. In this feature, The Log looks at one particular classic boat. 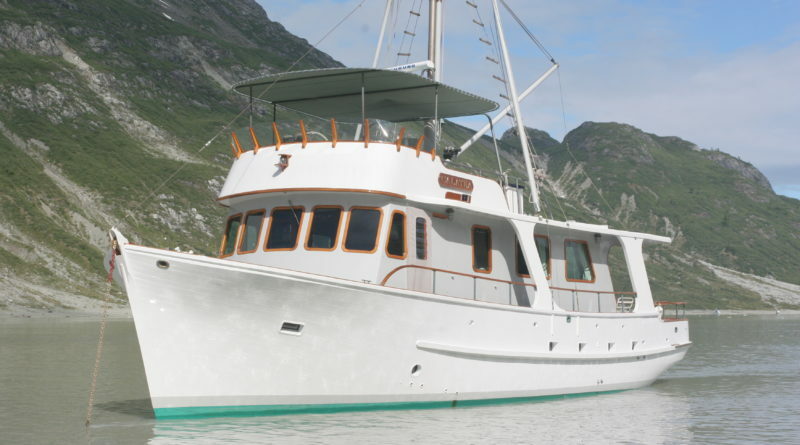 Galatea was one of 12 boats (six in Santa Barbara and six in San Diego) built as a trawler yacht in the 47- to 65-foot range, between 1957 and 1967. Arthur DeFever, a naval architect and designer of fishing vessels, designed the first line of these types of trawlers. Other previous owners of Galatea included an American Airlines pilot and Mike McKenna, a dealer of Audi and Volkswagen vehicles. A Welcomed Purchase: Brad Avery was racing in the San Francisco Bay, on one particular day, when his eyes fell upon a trawler. He noticed a man sitting comfortably in the pilothouse with the boat’s windshield wipers going back and forth on a damp day. Avery, who had been racing sailboats for 30 years, was tired and wet sitting on the railing of his sailboat. It suddenly dawned on him – he was ready to make a change. Avery said he always admired the rugged trawler quality of west coast commercial fishing boats. He liked the efficiency of a single-engine vessel. He also appreciated the large carrying capacity of the wide hull. Avery ended up buying Galatea in 2000. What’s in a Name: The initial owner’s wife, Violet Hanna, named this boat Galatea based on the Greek myth. All 12 of the trawler yachts made in that time period have their original name, according to Avery. Restorations: Avery said he has done nothing structural to the boat, but he has had everything refinished. All the electronic systems and much of the wooden interior have been replaced. Cruises: Avery has enjoyed Galatea for the past 17 years, taking many trips to the Channel Islands, down to Mexico and cruises up to Canada and Alaska. Galatea may be a little slow (top speed of 8.75 knots), but Avery said she can make it all the way from Newport Beach to Alaska without stopping for gas. Her range is 2,800 miles.